hi everyone! thanks for stopping by for the blog tour, I hope you've been enjoying it so far! 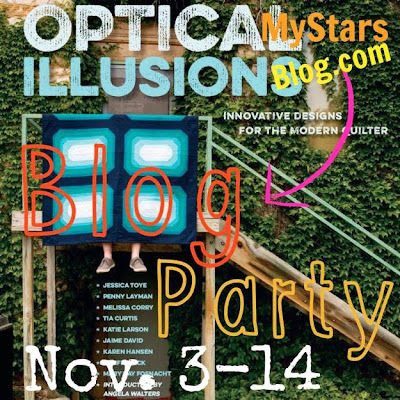 We're having fun showing off the projects compiled for Optical Illusions. This book is another winner from the growing library of My Stars. One thing I enjoy about their books is the staging choices for the quilt photos. The photos for Optical Illusions were shot in Lawrence, KS, one of our favorite places to hang out. It's a quirky little town, home of the Jayhawks, with a fun downtown, great quilt guild, brewery, delicious places to eat, live music, Sarah's fabrics... Can you tell I love it there?! Katie Larson's Curvilinear quilt is so cool. I love the movement and appearance of curves where there are none. And she made a single block version in another colorway, because she's fabulous. 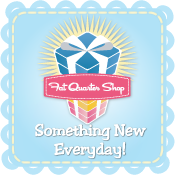 Read more about her quilts and see her mad crafty skills at her blog, the Crafting Shell. Tangerine Tumbler by Mary Kay Fosnacht is awesome. And that photo is the best, isn't it? I can see this quilt made in so many color combos! I also really like the Tropical Storm quilt by Tia Curtis. I like the subtle gradations of color and pops of prints. It would be a good stash buster project! Plus, half square triangles. You know I love them. You can see more photos of it at her blog today. 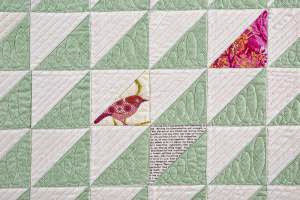 She did different quilting designs in each color, which makes it fun to look at. 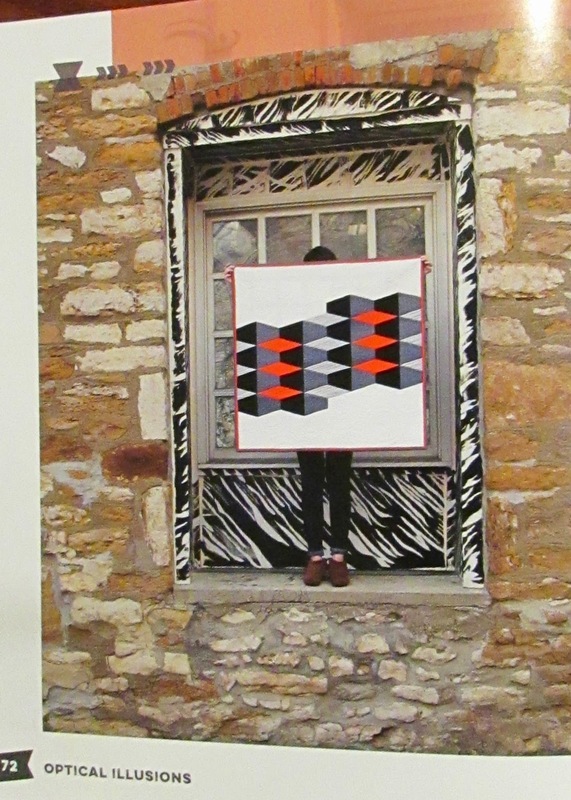 Those are just 3 of the 9 fantastic quilts in Optical Illusions. 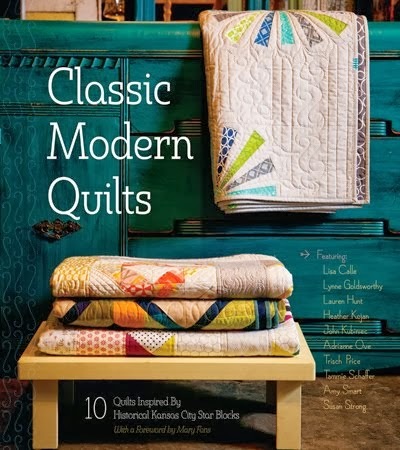 It's really fun to see these quilters unique talents showcased in a cool book. It's kind of like the show & tell at the KCMQG - inspiring and smile inducing :) You can grab a copy now at their site. 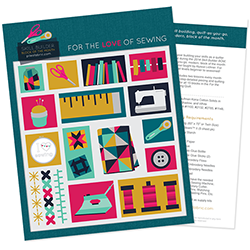 This book would be a great addition to any modern quilter's library. I am working on a few things such as scrappy trip bee blocks, pillowcases to use as gift wrap for holiday gifts, St. Louis 16 patch blocks and quilts, quilts and more quilts. I am working on a crib skirt and matching quilt for my little boy. I am working on a dress. I got to the point last night where I need to install the zipper. I had anxious dreams all night about that. I hate zippers! This week I am finishing up a set of seasonal and holiday table runners that will be a gift for a wedding shower. It will be 6 to 8 runners that will span the year. I just finished an autumn quilt yesterday and am trying to decide what to start on next. It will either be pj's fro Christmas gifts or another quilt. I'm fixing a christmas tree skirt and making a few pillows. I have an overwhelming list for Christmas, but I'm putting it off for one more week. I am having such a good time getting acquainted with new blogs thru this blog hop! I'm working on bags (from the company Swoon Patterns) and also cutting fabrics for a quilt for my granddaughter for xmas! This book looks awesome! I am working on 2 flannel rag quilts for Christmas gifts. Thanks! I'm working on designing a new Christmas tree skirt. Since we won't be home for Christmas this year, I have lots of time to get it done too! Thanks for the chance to win a copy of this great book! HI,still working on my baby charity quilt! Thanks for sharing in a great book giveaway! I'm working on blocks I learnt in a class that will become a Christmas table runner. I'm making a baby quilt for Rosa at the moment! Wonderful book, I would love to get my hands on a copy! I have just finished piecing the top for my Modern Maples quilt, and will soon start quilting it. I am currently working on a chevron based table runner. Love all of the inspiration in this book. I've been trying to work on several quilts, and some pouches. I love what I've seen so far in this book and would love to win! Thanks for the giveaway! I'm working on Christmas ornaments right now little poinsettias. I am working on a couple of pieces that I would love to have accepted for Quiltcon. Must get them finished first! I'm working on a man's quilt. It is taking me forever. Anyway, I look the look of the designs from this book. Stunning. Thanks for hosting the giveaway, I would love to win. I've also included your giveaway on my Giveaway List for just sewers & quilters at WowILikeThat.com. Thanks again. What a fun book! Right now I am working on a baby quilt for an friend. She wants it to be pink, green, and brown. These colors are so far out of my comfort range that I am having a bit of trouble choosing the fabrics. I'm trying to finish up some items for swaps! I am quilting a BOM I did this year using solids. Slow going! This week I am working on a Christmas tree skirt for my son. I made him one a few years ago, but his ex-girlfriend took it with her when she left. So, I'm back at it again. I think I'll embroider his name on this one. 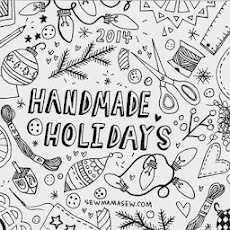 This week I am working on quilting an embroidered Christmas quilt, hopefully I can get it done as I have a couple of other holiday sewing I would like to do. 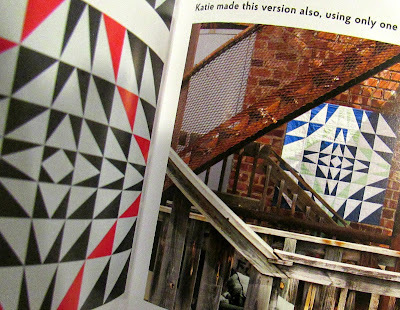 I love that first quilt pictured, this looks like a great book :) I am quilting my Doctor Who quilt today. I'm working on college applications with my daughter. It's been an ongoing project now for weeks!! Today I am working on a chevron baby quilt and throw for an fundraising auction to be held next week. Thanks for offering a giveaway. This books looks great. I have been out of town for nearly three weeks so I am behind on my sewing. I foresee some late night sewing in my future. I finished up a modern quilt last week so this week it is working on a charity quilt and a friendship block swap quilt. Love the illusion quilts so much. I am working on machine quilting a Halloween quilt. Working on a dress for my daughter for Christmas! I'm working on so many projects right now. Quilts for my two daughters for their new room, a playhouse from Santa, and a Swoon quilt that's on the back burner while I do the other projects. I am working on quilting my daughter's "quilt outside the blocks" quilt. Thanks for the chance to win this wonderful book. My son-in-law is a big Jayhawks fan! He attended college in Lawrence. I would love to visit there sometime. I am working on the binding a quilt for my 4 year granddaughter's bed. I am piecing a quilt top as a pattern tester, and am working on a couple smaller quilts, one a gift and one a low volume project. I am working on a wall hanging for my son and his girlfriend using Ricky Timm's transvergence pattern. Thanks! I am really enjoying this blog hop-- so many interesting quilt. Can't wait to get my hands on this book! Such cool stuff. Working on some curved piecing and some ornaments. Looking forward to a DS shipment!